Do you use pictures in your emails? Most people do. Did you know that there is a problem you might face if you use iOS devices like iPhone or iPad? Whenever you reply to a message or forward it using such a native mail app, graphical elements such as pictures, logos or banners get deleted. That is a default behavior for iPhones and iPads, but there is a solution which works on Exchange Server. Why are images deleted from iPhone or iPad? That is just the default behavior in native iOS mail app to delete images from email body when you reply to a message. It might be a way to declutter mailboxes and to save some space. Maybe it is designed that way because the original recipient has already seen the images. Although this might be found as perfectly logical, for some it is a twisted logic as it makes doing your job harder. 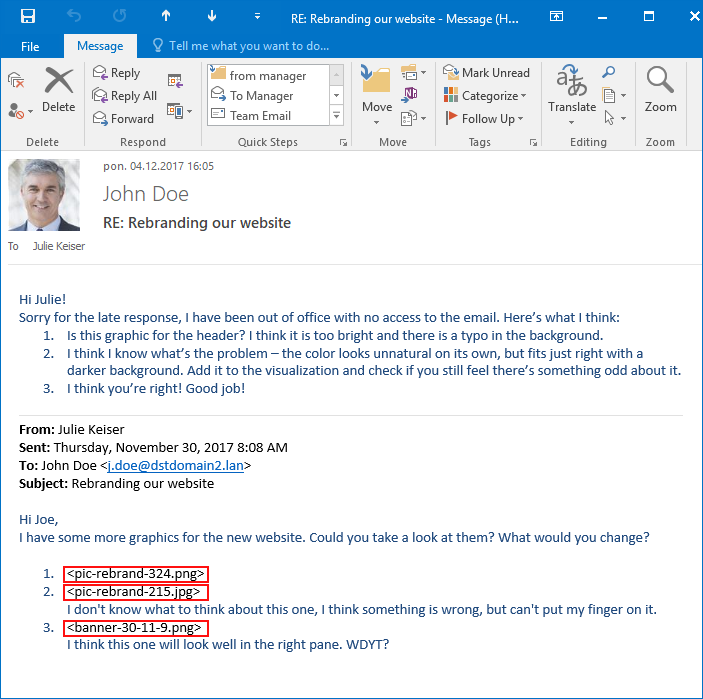 In most scenarios, email signature image or any other graphical element disappears and is replaced by a placeholder, like <image.png> right after you hit a reply button. A colleague sends you a few images for review. Normally, you would reply “Change this in picture 1, delete picture 2 add that to picture 3…”. But if you respond using iPhone, the images will not appear in the email body. This means that the colleague will have to find the right email in their Sent items folder and compare it with your comments. You design and apply a professional email signature. You make sure that everything is compliant with your company’s visual identity, marketing banners are all sparkly and enticing, and your photo is smiling at the recipient. But when someone in the thread, replies using an iPhone, everything crumbles. Instead of all those carefully prepared images, all people can see is <image1.png> and similar boxes. If your company uses Exchange Server, we have a solution for you. 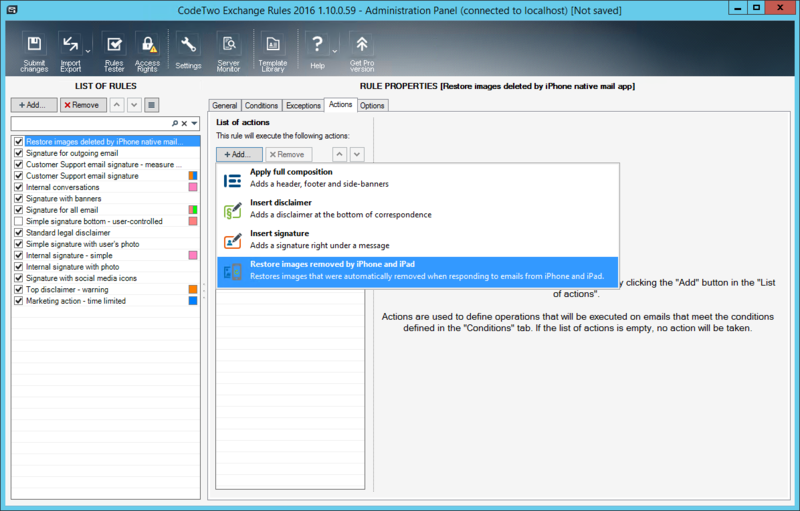 CodeTwo Exchange Rules, our email signature management software, can now restore images removed by iPhone’s or iPad’s native mail app. 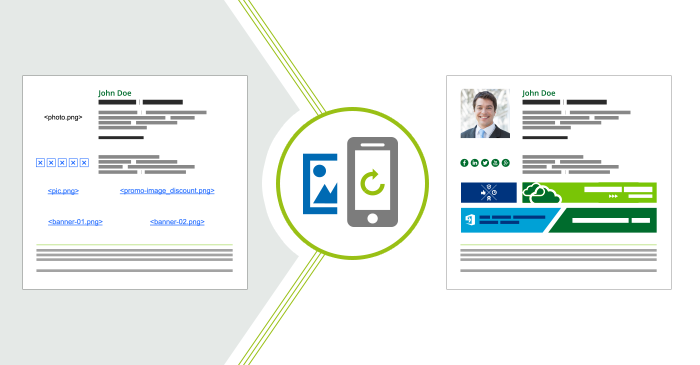 CodeTwo Exchange Rules adds server-side email signatures to emails. 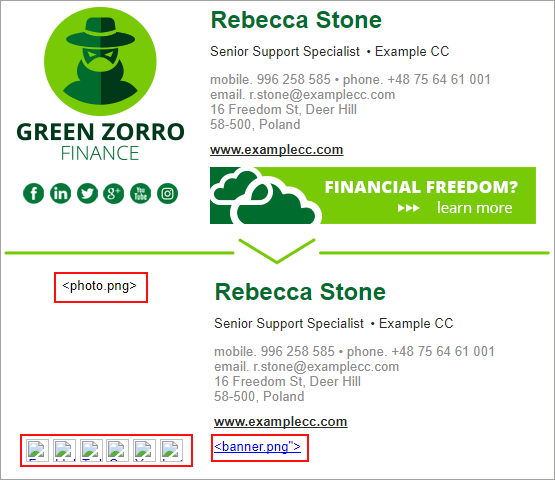 The software makes it easy to create professional, personalized email signatures and add them to all emails. There is no need for users to do anything on their side, and a basic configuration of this management tool should not take more than 15 minutes. Click here to learn more about the program’s features. The fix is very simple. Just add Restore images removed by iPhone and iPad action to the rule which adds signatures to emails sent by your users, or create a new rule with this action, and the images will remain in your and your clients’ emails. The action cannot prevent iOS devices from deleting images, but it can restore the deleted images on the fly when the email goes through the server and before it reaches the final recipient. 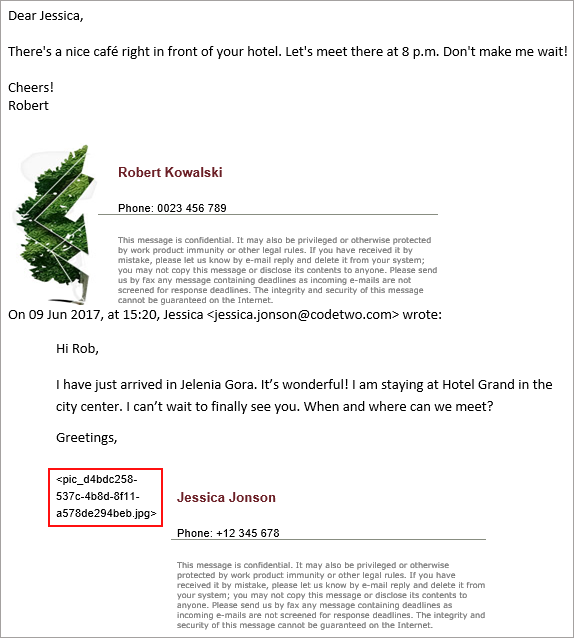 Thanks to that, CodeTwo Exchange Rules can unify your email signatures and ensure that no images disappear from your conversations. Read more about Restoring images deleted by iPhones and iPads in CodeTwo Exchange Rules. And there is no setting in the iOS mail app to prevent it from removing the images ? Sorry, currently there is no setting in the native iOS app that will prevent it from removing the images. I have written that it is the default behavior to emphasize it was designed that way, but it can be fixed using, for example, CodeTwo Exchange Rules. Besides, there is always hope that it will be redesigned in a future iOS update. What to do when we don’t have onpremise exchange servers, and everyone in the company is using iOS ? I don’t think that there is a simple solution for this scenario. One way that could fix this issue would be to try out other email client apps for iOS. Still, for the problem to disappear, everyone would have to switch from the native Mail App to this other email client.